An advertisement for a directory of Estacada-area churches encouraged readers to live "happily ever after" through faith. "God's love is the only way to find real and lasting happiness. Comfort, strength and purpose are yours for the asking. Why not attend your church today and find new inspiration for your life?" Churches featured in the directory included Estacada Methodist Church, Estacada First Baptist Church, Estacada Church of God, Assembly of God Church and Dodge Community Church. The Estacada Christian Women's Club would soon embark on an "exciting" animal safari at the Safari Club. "As a special feature for you there will be a Safari Film and our music will be by Bob and Carolyn Brown," The News reported. Items on the newspaper's community calendar 30 years ago included the Estacada Community Safety Fair at Estacada High School and a meeting of Citizens Organizing for the Future of Estacada at L.B. 's Restaurant. Joanne Broadhurst and Gloria and Jerry Polzin had been named the Estacadans of the Year. Both Gloria and Jerry were members of the Estacada Community Response team, which developed a strategic plan for the area; members of the Estacada Citizens for Fairness; and involved with Toastmasters International. 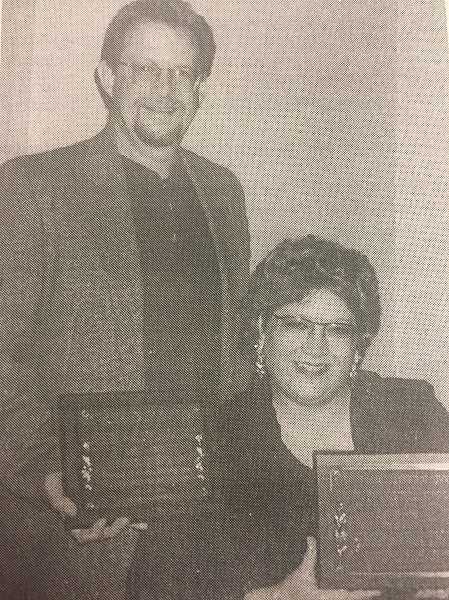 Both were active members of the Estacada Chamber of Commerce, with Gloria being a past president of the group. The couple were also summer storytellers at the Estacada Public Library. Joanne was a a great-great granddaughter of Philip Foster and a founding member of the Jacknife-Zion-Horseheaven Historical Society, the group that manages the historic farm of her ancestors. In addition to teaching business at Estacada high School, Joanne was also a member of the Estacada Chamber of Commerce, the Oregon Society of Public Accountants, the American Institute of Certified Public Accountants, The Oregon Historical Society, the Baker Cabin Historical Society and the sons of Daughters of Oregon Pioneers. Her accounting firm did pro-bono work for the Estacada Community Center. The Oregon State University Extension had teamed up Estacada and other school districts around the region for a nutrition education program, funded by the U. S. Department of Agriculture. Through the program, nutrition educators visited classrooms weekly, taught about the food pyramid and offer healthy snacks. "I think it is wonderful because my students are getting to try something they may not have tired. They can take the recipe home to their families," said Renee West, a second grade teacher at Clackamas River Elementary School. Attendees of the Chamber of Commerce's inaugural Spring Gala had a great time. "I've seen faces I haven't seen in years," Mayor Sean Drinkwine said. "(The gala) showed the community we can all be one and come out successfully, and it showed that we work well together. I think everyone felt like they were a part of something."